Oh wait, you’ve tried everything known to man for headaches and migraines and been disappointed… Hoping for a natural (much less free or fast) solution is for dreamers, right? It would be easy to get frustrated and give up or get skeptical that after trying 100 things, #101 could work…or that #101 even exists. I hear you….BUT even after relentlessly studying migraine relief and speaking with experts across the globe, I continue to discover more. I love coming across new tools and techniques that can offer relief because I know not any one thing will work for everyone. And that’s why it was such a gift to meet Brodie and get to interview her about the acupoints she uses in her practice and teaches her clients who suffer from migraine headaches. Unless you are a master of Chinese Medicine, I can pretty much guarantee you will learn a lot from Brodie’s interview and pick up some new tools for your toolbox. 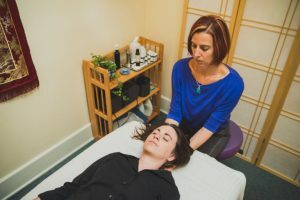 Brodie Welch is a Licensed Acupuncturist, board-certified herbalist, qigong teacher, holistic health counselor, Aroma Acupoint Therapist™, and Chinese Medicine educator practicing in Corvallis, Oregon. In addition to her clinical practice, Brodie shares her passion for Chinese Medicine through teaching and her podcast A Healthy Curiosity. She loves catalyzing change for her patients and students by helping them understand the links between the body, mind, and spirit as described in Chinese Medicine and does just this in our conversation about the energetic causes of migraine headaches. To get your copy of the guide that Brodie put together for you click here or go to www.brodiewelch.com/migraine and click on the preview image. Then leave us a comment below with your favorite thing you learned from this video! Luckily I don’t suffer from headaches or migraines, but I know many who do. I’ve had acupuncture for many years, actually it’s a part of my life and I try to have at least a quarterly session to prevent any problems. Thank you for sharing all these amazing actionable tips. I love Chinese Medicine and I cannot wait to try these! I do not have migraines that often, but when we went through the last pressure change with the weather, I for sure thought of your blog and some of the things I have learned here! So really, thank you for all the work you do in this area! I have suffered from migraines for most of my adult life Every thing that was discussed was dead on from the weather to strong smells to other peoples negative energies they all affect me and all your views and advise on balance and so on were great and thanks for the accupoints, the cube head really helped ! WOW!! What a wealth of information here. I learned so much and will be sharing this with others! Thanks so much for another super-informative post! !